Today on this great #WorkingWomenWednesday, opening the show from Working Women of Tampa Bay, we had Jessica Rivelli discussing her upcoming leadership lessons, with women talking about their experiences in growing their careers. 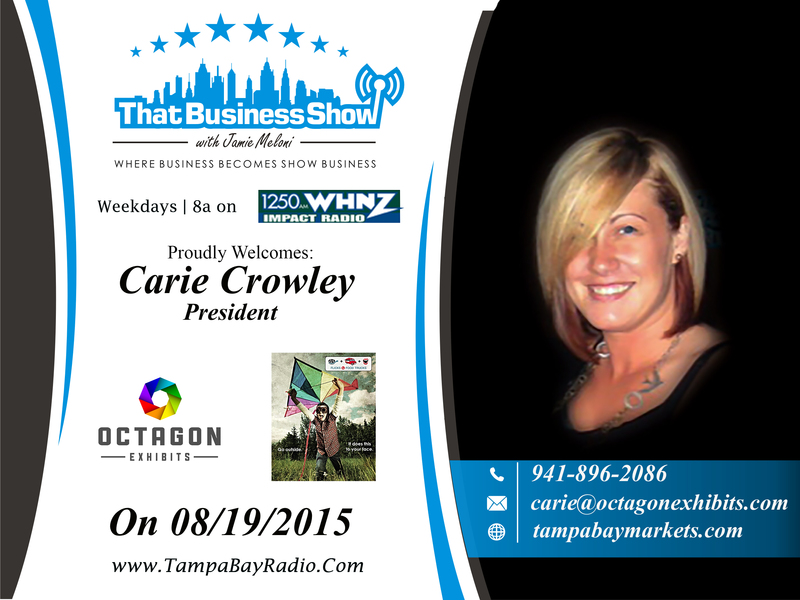 We featured Carie Crowley from Octagon Exhibits and Tina Leger from Top Tier Expo on #ThatBusinessShow with Jamie Meloni. #ThatBusinessShow begins at 8am every weekday morning at 1250whnz or at http://www.tampabayradio.com/ or catch the live footage at http://www.youtube.com/jamiemeloni. Because it’s #WorkingWomenWednesday, we had our special guest Jessica Rivelli come in from Working Women of Tampa Bay opening the show. She told us about her leadership event coming up this Friday with special guests in the lineup. It’s happening on Friday, August 21st at 9-11am at the c1 bank headquarters in downtown St. Petersburg. The event will feature women who will share their stories of becoming successful despite adversity, and sharing their wisdom with the guests to help the community and local entrepreneurs. There are 10 V.I.P. tickets left so check that out at http://www.workingwomenconference.com, and using the promo code meloni2015; you can get 10% off the tickets! You can find out more about Working Women of Tampa Bay at http://www.workingwomenoftampabay.com. Carie Crowley is the CEO & Founder of Octagon Exhibits, a managing partner in Tampa Bay’s most beloved Food Truck Event, Flicks & Food Trucks. Carie has a passion for Tampa Bay’s local community. We got to discuss the national brands she’s worked with, including NASCAR, Humana, AT&T, and down here in Tampa Bay with Working Women of Tampa Bay. We also discussed the Flicks & Food Trucks event, and how it provides an outlet for the community to connect. The Flicks & Food Trucks events happens the 3rd Thursday of every month – 6 pm-10pm, at The Grand Central at Kennedy, 1208 E. Kennedy Blvd 33602. See site for more information! She shared with us the story of a local vendor who started with a food truck at Flicks & Food Trucks and now has a restaurant in downtown Tampa. You can learn more about Carie and Octagon Exhibits and Flicks & Food Trucks at http://www.tampabaymarkets.com. You can contact Carie with any questions at carie@octagonexhibits.com or at 941-896-2086. Tina Leger is part of the husband and wife duo of Top Tier Expos, with over two decades each of event production and promotion. She brings a wide range of expertise to the business of producing, marketing and executing everything from concerts, banquets and large scale shows. Tina prides herself on bringing local businesses together for an interactive trade show which grows the community. Working with large corporations, she can bring the best to any event. She told us about the upcoming Tampa Bay Women’s Expo on October 3rd at the Florida State Fairgrounds in Tampa. You can find out more about The Women’s Expo in October, also about Tina Leger and Top Tier Expos at http://www.toptierexpos.com/. 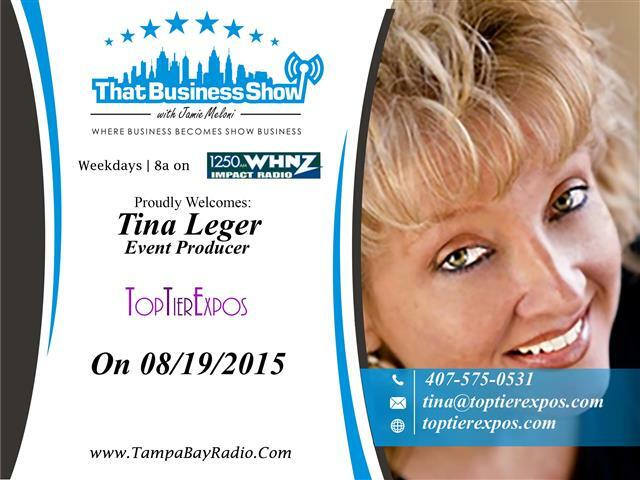 You can contact Tina with any questions at tina@toptierexpos.com or at 407-575-0531. As always thank you for joining me on #ThatBusinessShow on 1250whnz every weekday at 8am. And if you missed us, you can check out the video on http://www.youtube.com/jamiemeloni or look up #ThatBusinessShow on iTunes Podcasts. This entry was posted in Entrepreneurship and Business and tagged business, entrepreneur, show business, working women of tampa bay, working women wednesdays. Bookmark the permalink.